Digital Health Solutions. Powered by Music. MindRazr offers a comprehensive tool kit of exercises to help improve both mental and physical wellbeing. Music and wellbeing content combined and customised by YOU. Learn more about MindRazr for Individuals. Discover MindRazr for Workplaces and Organisations. Record and upload your own audio and video exercises. Create structured digital training and treatment programs for existing customers or expand your reach to individuals and organisations around the world. Learn more about what MindRazr does for a growing tribe of Healthcare Professionals. Health & Wellbeing platform for schools. Learn more about Mindrazr for Schools. MindRazr is the World's first digital music, health and wellbeing platform, that harnesses the power of music to make you healthier and happier. 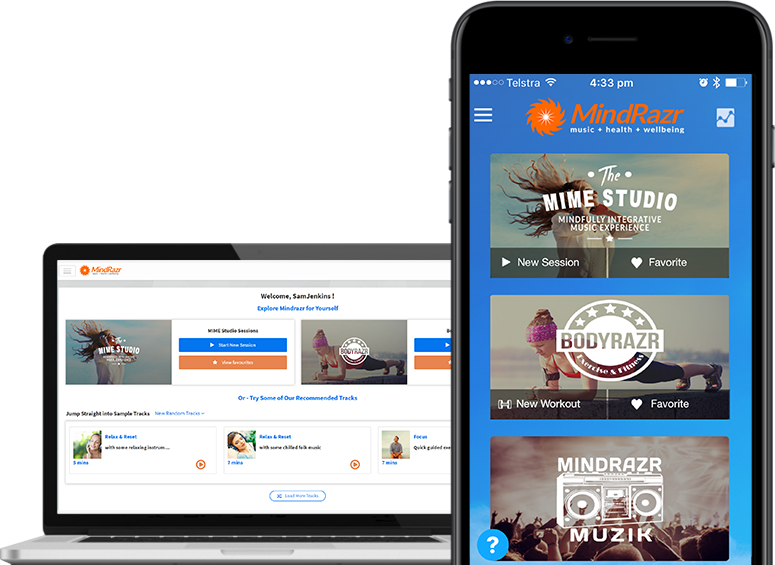 From the MindRazr mobile and web applications you can access a comprehensive toolkit of physical and mental guided audio and video exercises and seamlessly combine them with your favourite music to build your own unique sessions. Whether you want to stress less, eat and sleep better, or just be more present and engaged with your friends and family. Improving your Health and Wellbeing has never sounded as good as this. 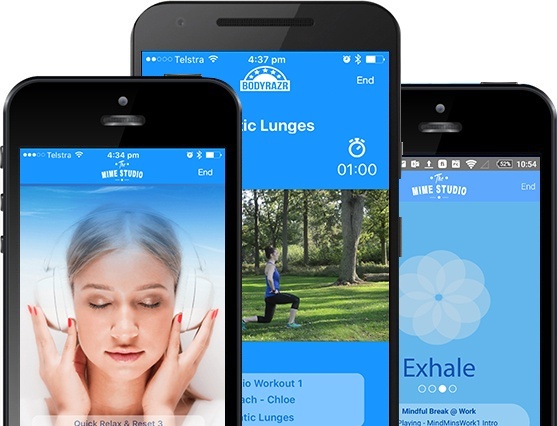 With MindRazr, your employees can completely customise their own wellbeing program in an enjoyable, effective and measurable way. Customise your own branded app and upload audio and video exercises that customers can stream anywhere, anytime. Music should be more than just background noise in the daily grind. MindRazr helps you unlock the cognitive and emotional benefits that can be gained from listening to your favourite music. Choose from a extensive and ever growing range of exercises for your physical wellbeing ranging from yoga to high intensity interval workouts to help you to build better lifestyle habits. Music contains our memories and emotions and is one of the most prevalent and enjoyable tools we use to regulate our emotions. Re-connect and re-engage with your favourite music and tap in the cognitive and emotional power that your favourite music holds. Ready To Try Mindrazr Free?